a Thing of the Past...GUARANTEED!! 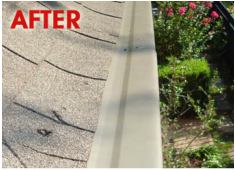 Leaf Shield is a solid aluminum cap that installs directly to your existing gutters. Leaf Shield's unique design is based on the scientific principle of liquid adhesion. As water flows over the Leaf Shield the molecular attraction between the metal and the water causes the water to cling to the surface and follow the bends around the nose of the Leaf Shield allowing it to drain into the gutters. At the same time leaves, pine needles, and other debris fall to the ground. Leaf Shield is barely perceptible from street level, compatible with any architectural style, and designed to visually merge with your guttering and roof. Leaf Shield protects your biggest investment... your home! !